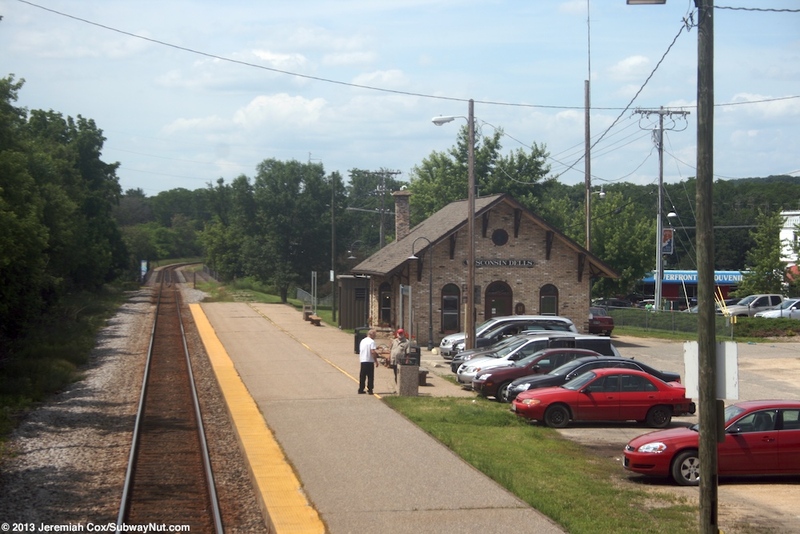 Wisconsin Dells, WI Amtrak station serves the theme and waterpark park town right in the middle of Wisconsin. 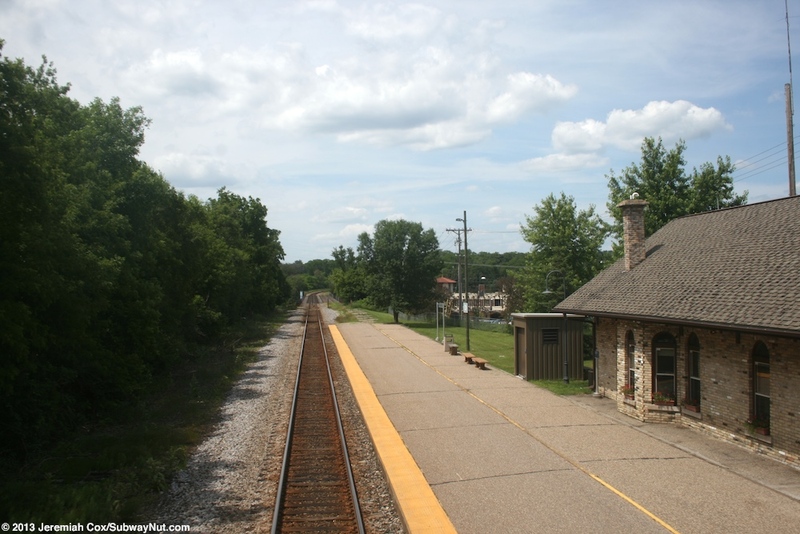 The Amtrak Station is located within walking distance of the various shops and amusements in this town. 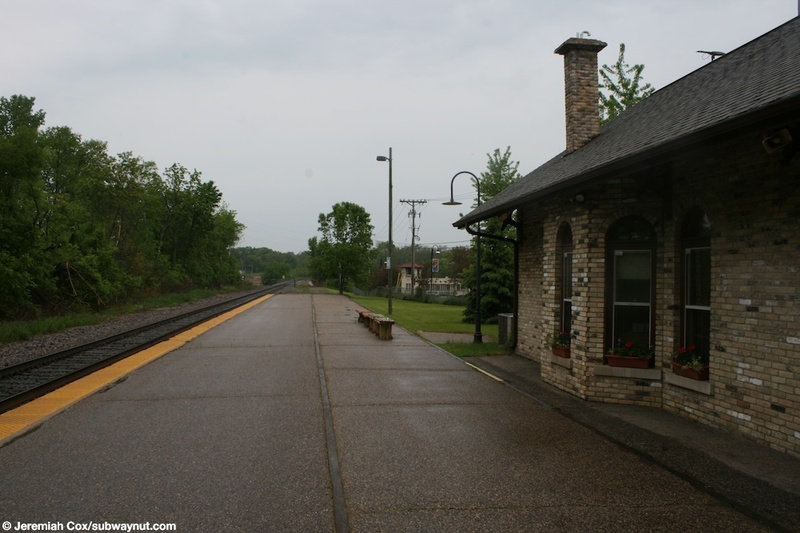 The Amtrak station consists of a old fashioned retro-style looking station building, that infact only opened in 1989 replacing a previous station house, with wooden benches and antique light fixtures that is unstaffed but opened around the two hours of the Empire Builder's stop at the station in each direction. This is along a simple long concrete platform with a tactile warning strip. 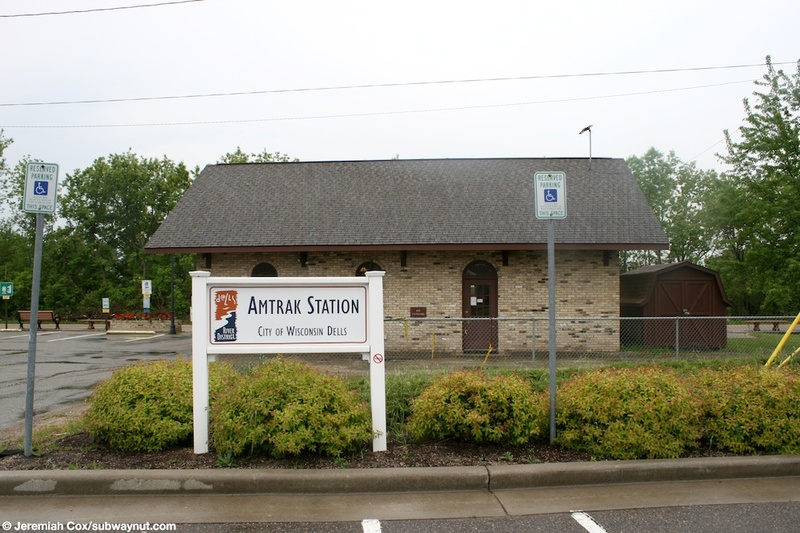 One major sign of the fact that the station is in a town of tourists is one in the station window saying that restrooms are for Amtrak customers only. 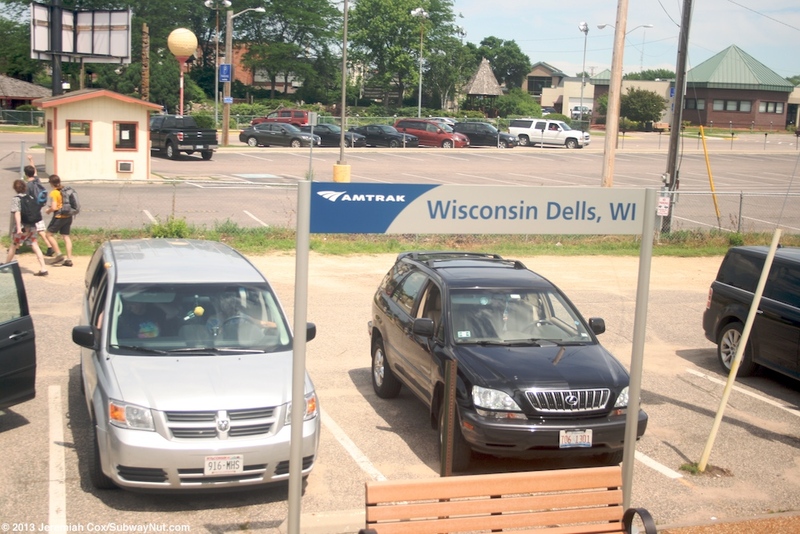 An unusual Amtrak Station sign, probably signifying that the station building is owned by the City of Wisconsin Dells. 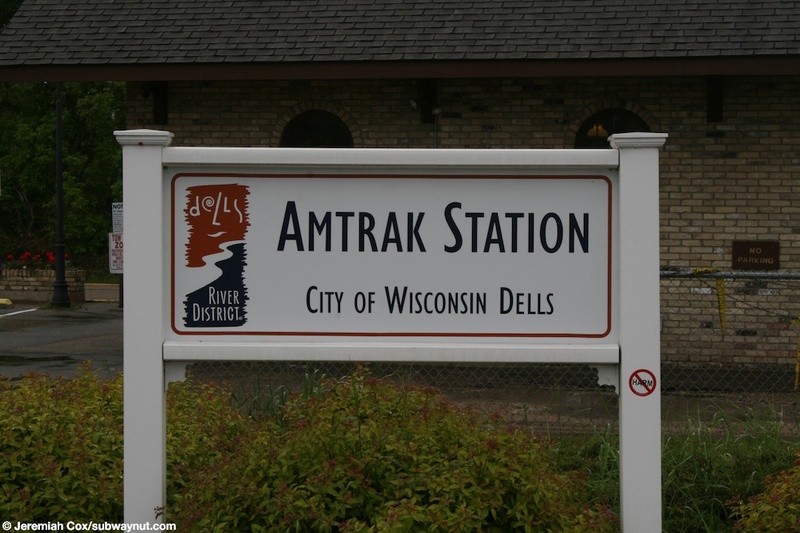 The unusual Wisconsin Dells, WI Amtrak Station sign with the station building behind it. 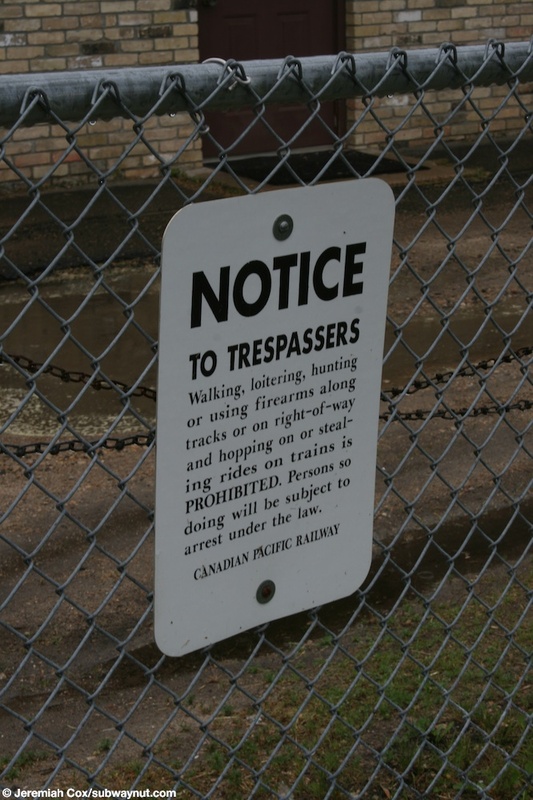 Along a fence near the Wisconsin Dells, WI station platform there's a Canadian Pacific Railway basically saying that trespassers will be prosecuted. 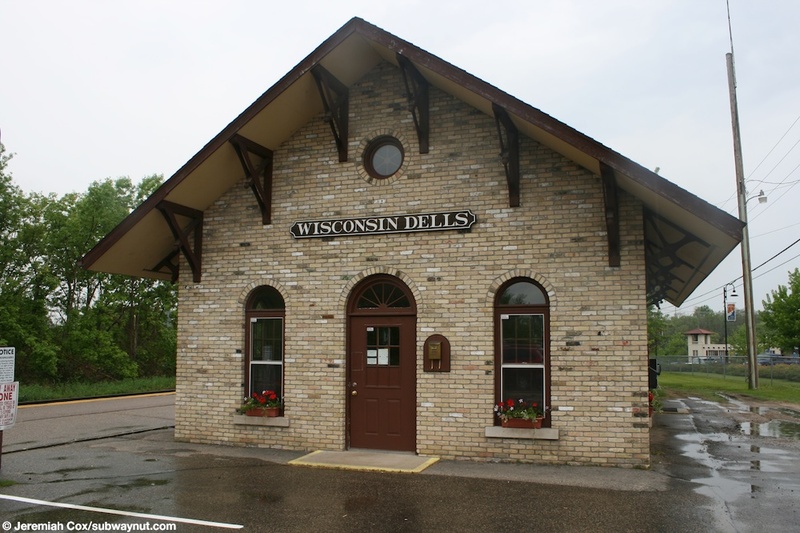 A side view of the small Wisconsin Dells, WI station building the main entry door is visible. 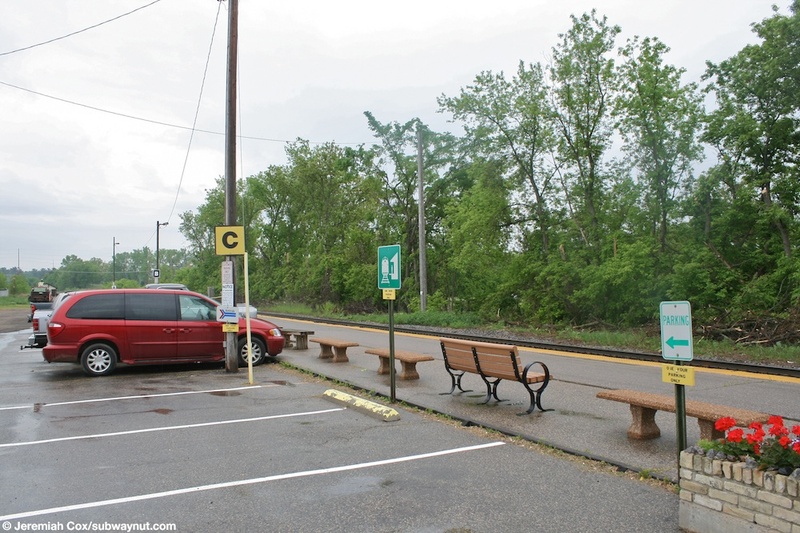 Some benches and plants are all that divide the small parking lot and the platform. 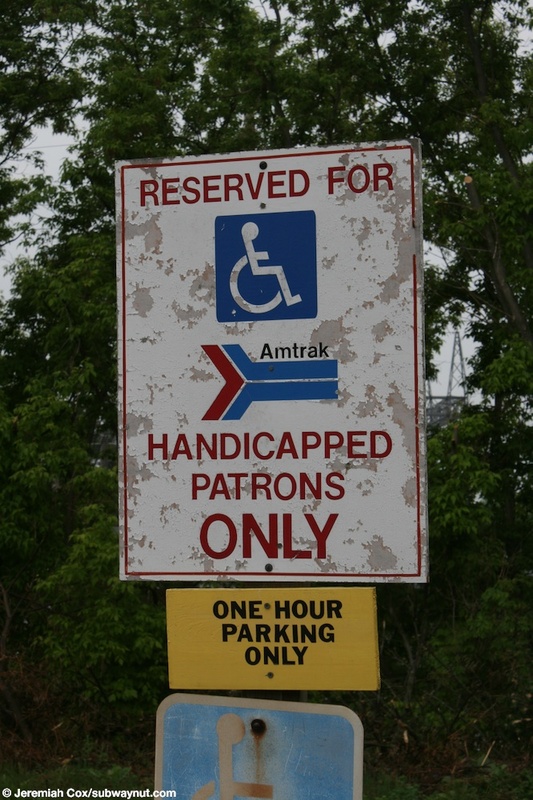 A fairly complicated sign for a parking space reserved for Amtrak Handicapped Patrons Only, for only one hour. 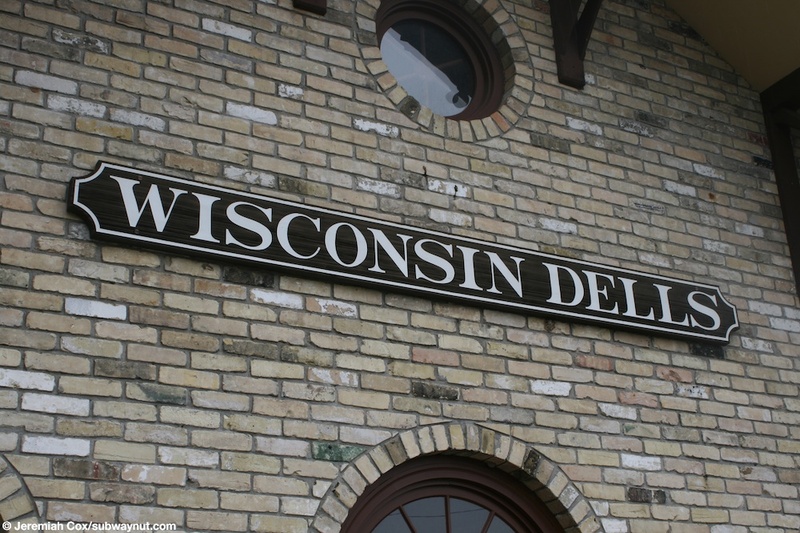 A close-up of the unusual Wisconsin Dells station sign on a side of the station house, no standard Amtrak signs were found at the station. 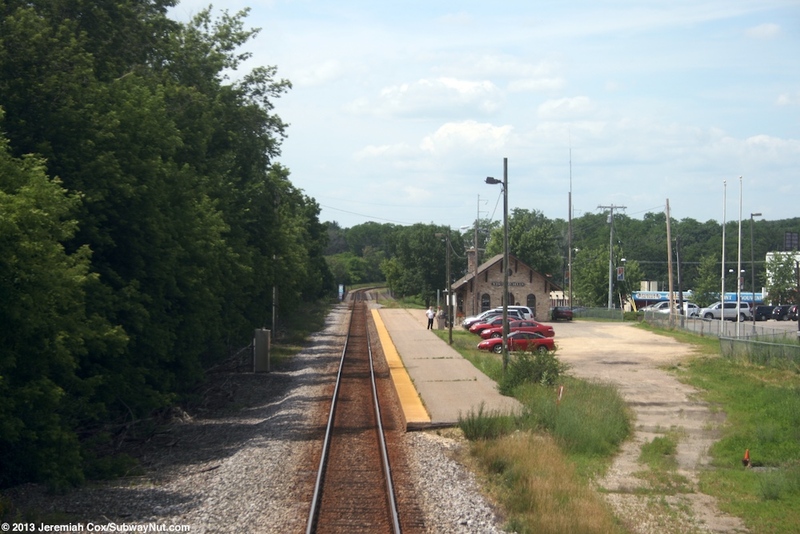 Looking down the platform at Wisconsin Dells, in front of the station building. 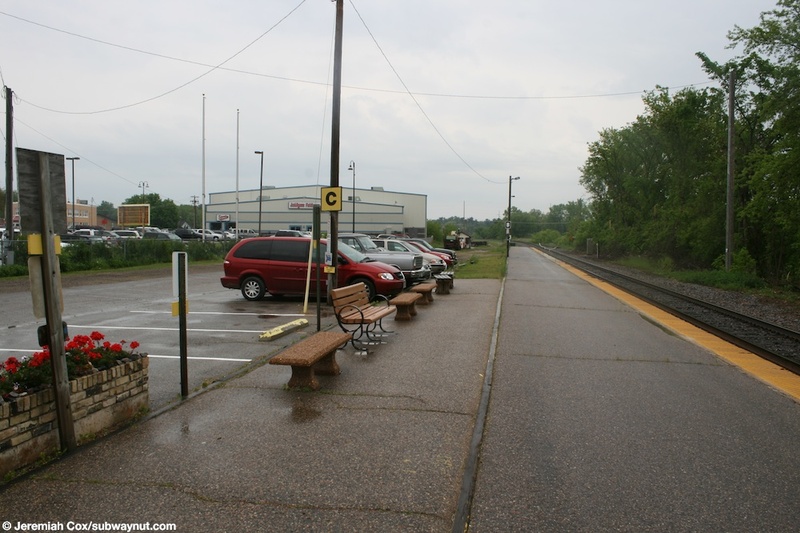 The platform at Wisconsin Dells is long enough to fully serve the long Empire Builder train, some benches are also visible in this picutre and the small parking lot. 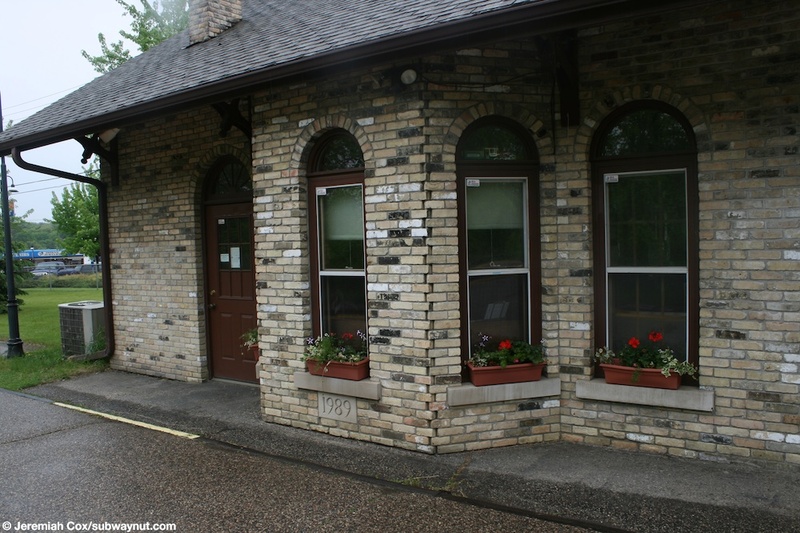 Windows in the retro station house overlooking the platform at Wisconsin Dells, a cornerstone saying 1989, meaning the station is not old but built to look retro is also visible. 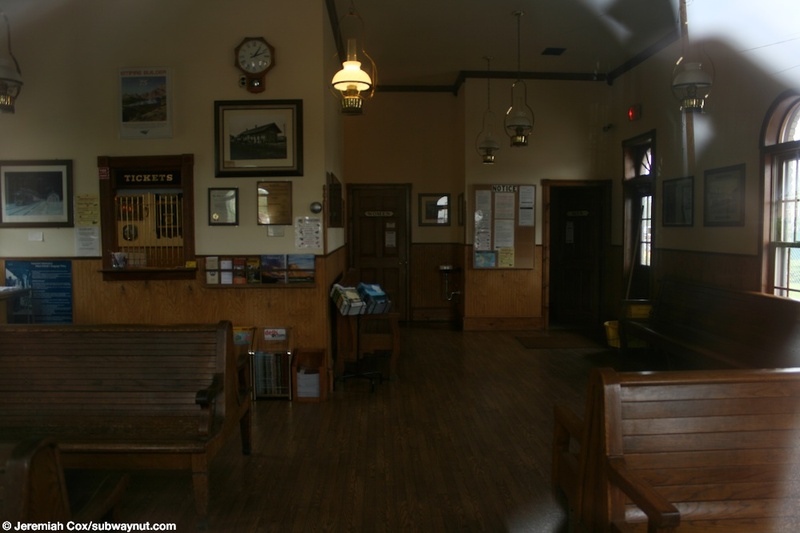 Looking into the waiting room at Wisconsin Dells, their still old wooden benches and a ticket window (through the station claims to have no ticket sales), notice the vintage lamp that hangs from the ceiling.